The Metropolitan makes life more fun. Now you can get around town without any hassles. Traffic? Please. Can't find parking? Yes, you can. High gas prices? Not an issue. All you have to do is put on your helmet and enjoy the ride. Sure, it looks cute in new Coastal Blue or Pearl Soft Beige, but underneath that curvy bodywork, it's pure Honda. It has a fuel efficient, liquid-cooled four-stroke engine, a no-shift automatic transmission. All you have to do is turn the key, press the electric starter, and go. It even has lockable underseat storage, perfect for grocery runs. The Metropolitan may be endlessly practical, but when you ride it you'll see it's also endlessly fun. Make a Style Statement: The Metropolitan just looks like it's going to be fun, and it sure is. There's something about its classic, curving scooter shape that's both practical and inviting. Check out the handlebar-mounted headlight and instruments, and for 2019 two great new paint colors. 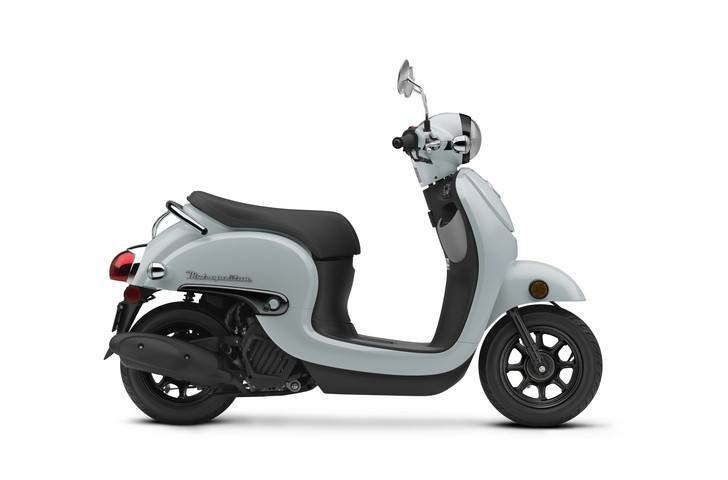 Fuel Injected, Fuel Economy: Under that classic scooter bodywork, the Metropolitan uses a 49cc liquid-cooled four-stroke engine with fuel injection. Smooth, powerful, super reliable and environmentally conscious, it also gets over 100 miles per gallon! *: **Honda's fuel economy estimates are based on EPA exhaust emission measurement test procedures and are intended for comparison purposes only. Your actual mileage will vary depending on how you ride, how you maintain your vehicle, weather, road conditions, tire pressure, installation of accessories, cargo, rider and passenger weight, and other factors. It's All About Solutions: The Metropolitan is one of the best urban errand-runners ever. There's a convenience hook that holds totes and grocery bags, an inner rack that catches your water bottle or other small items, and a full 22 liters of secure under-seat storage that holds a helmet and more. V-Matic Automatic Transmission: The Metropolitan's multi-speed automatic transmission means no shifting ever—not even into park or neutral. Just turn the key, press the starter button, and go! Programmed Fuel Injection (PGM-FI): The Metropolitan features a liquid-cooled 49cc four-stroke engine with fuel injection. It's quiet, economical, and super reliable—everything you'd expect from a Honda. Instruments: A clean, stylish instrument panel is right in line with the Metropolitan's smart design. Note: *Honda's fuel economy estimates are based on EPA exhaust emission measurement test procedures and are intended for comparison purposes only. Your actual mileage will vary depending on how you ride, how you maintain your vehicle, weather, road conditions, tire pressure, installation of accessories, cargo, rider and passenger weight, and other factors.